Antibiotics are small molecules, originally discovered as defensive molecules made by fungi and other organisms, and now created by medical scientists. They bind to essential bacterial molecules, such as enzymes and ribosomes, blocking the growth of the bacteria or killing them. Because these bacterial proteins are structurally different from their animal equivalents or are non-existent in them, they cause no harm to the organism treated for bacterial infection. Figure 1 presents main classes of antibiotics and their target protein/molecule organized by the biochemical process that they interrupt in bacteria. In this video challenge, we will be focusing only on the action of and resistance to the aminoglycoside class. Last year’s challenge was focused on the beta-lactam class. The aminoglycoside antibiotics are made by some bacteria to protect themselves from competing bacteria. They are particularly effective because they are very specific: they attack bacterial ribosomes, corrupting protein synthesis in the bacterium, but they don't attack the ribosomes of many other organisms, including our own ribosomes. Ribosomes are the molecular machines that build new proteins based on the genetic information carried in the messenger RNA. Ribosomes are made up of multiple protein chains and rRNA that form the small and the large subunits. To learn more about the ribosomal subunits, read the Molecule of the Month on the topic. Figure 2 shows eukaryotic and bacterial ribosomes drawn to scale and highlights the key differences in the nomenclature of their key components. Eukaryotic ribosomes; PDB ID 6ek0 and prokaryotic ribosomes; PDB ID 4v5d. Despite structural differences, the ribosome in bacteria and prokaryotes follow the same steps in protein synthesis. Once the messenger RNA and a special initiator tRNA (different for prokaryotes and eukaryotes) bind to the smaller subunit of ribosomes, both subunits come together, creating the enzymatic environment for creating new protein chains. 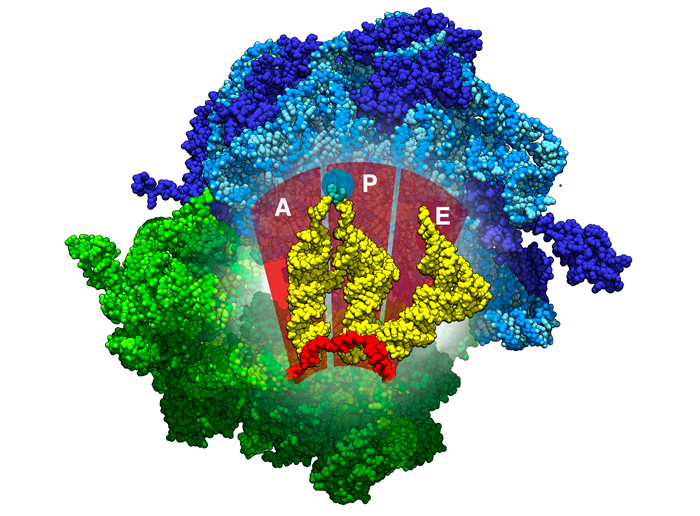 The stages of protein synthesis are described in the Molecule of the Month on Ribosome. The ribosomes have 3 binding sites for the tRNA: A (acceptor site), P (peptidyl site), and E (exit site). Figure 3 shows the locations of these sites inside the ribosomes. The A (acceptor site) site is where the a tRNA carrying a matching codon to mRNA binds. During this step, the ribosome uses several interactions to test this pairing, ensuring that the base pairing is correct. You can explore these interactions in 3D in the Exploring the Structure section, in the Molecule of the Month on Ribosome. The aminoglycoside antibiotics bind at the A site and they interfere with the recognition of the the matching tRNA, ultimately leading to mistakes in building the new protein chains. You can explore the aminoglycoside binding site in 3D in the Exploring the Structure section of the Molecule of the Month on Aminoglycoside Antibiotics. Another mode of action for the aminoglycoside antibiotics is binding to the large subunit of the ribosome and causing problems at the end of protein synthesis, blocking the recycling of ribosomes after they are finished making a protein. 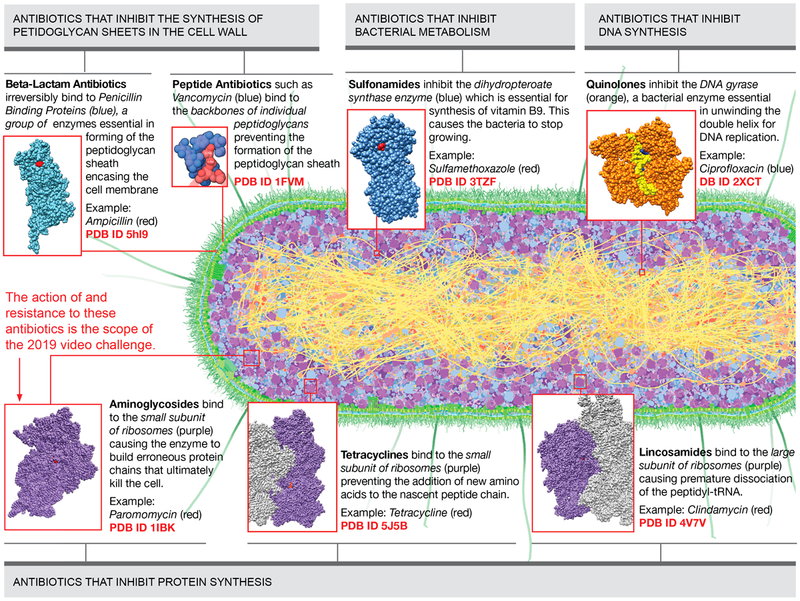 You can explore this process in the Structural Biology Highlights article Antibiotics and Ribosome Function. Aminoglycoside antibiotics are used mainly to treat infections caused by gram-negative bacteria in a clinical setting. 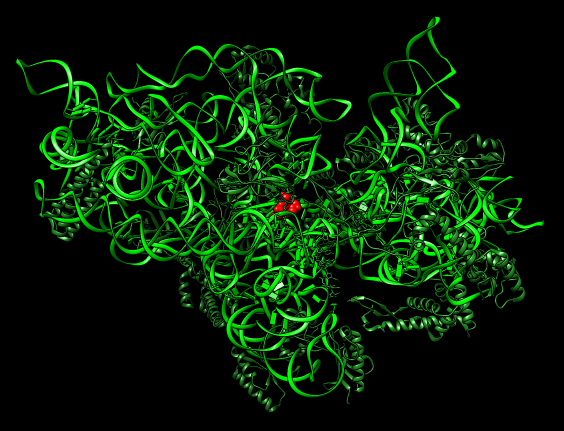 This structure shows the small subunit of the ribosomes (colored green in the Chimera session) with streptomycin (SRY - red) attached in the active site. 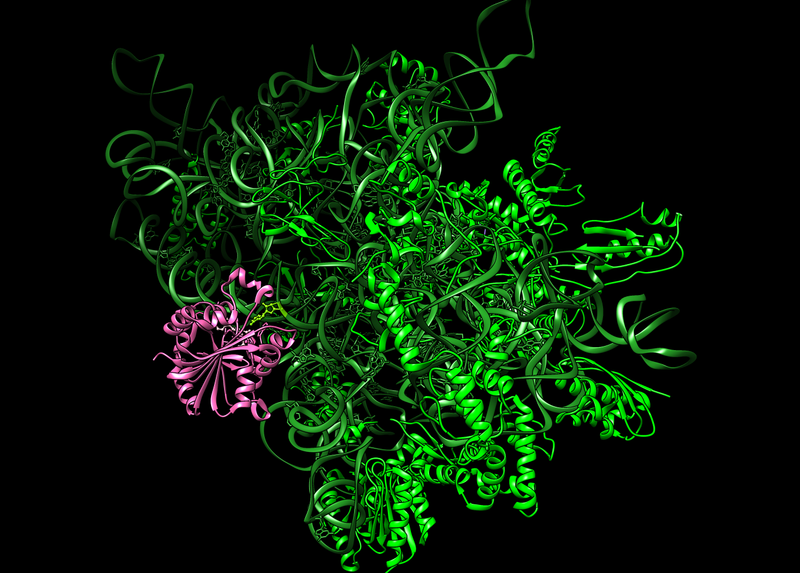 Crystal structure of the bacterial ribosome from Escherichia coli in complex with gentamicin. This structure shows the large and small ribosomal subunits (colored blue and green respectively in the Chimera session) with gentamycin (LLL - red) attached in the small subunit’s active site (interfering with the protein production) and in the large subunit’s active site (blocking the recycling of the ribosomes). 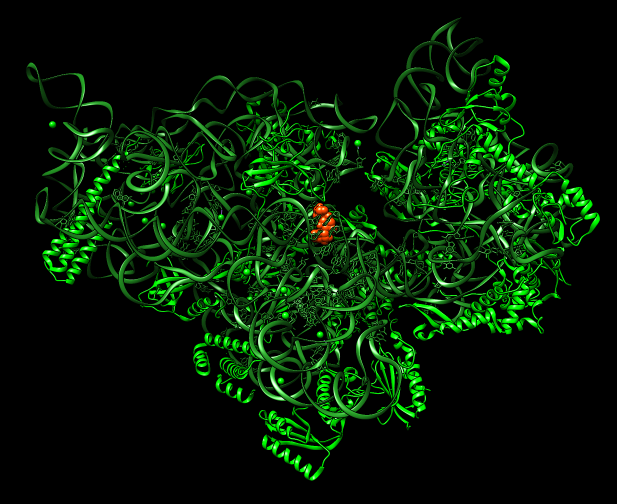 This structure shows the small subunit of the ribosomes (colored green in the Chimera session) with tobramycin (TOY - red) attached in the active site. There are two ways in which the resistance genes for each of these mechanisms can be passed on: via Chromosome, where the gene is transferred from generation to generation (vertical transfer) and via a plasmid that can be passed from bacterial species to species (horizontal transfer). 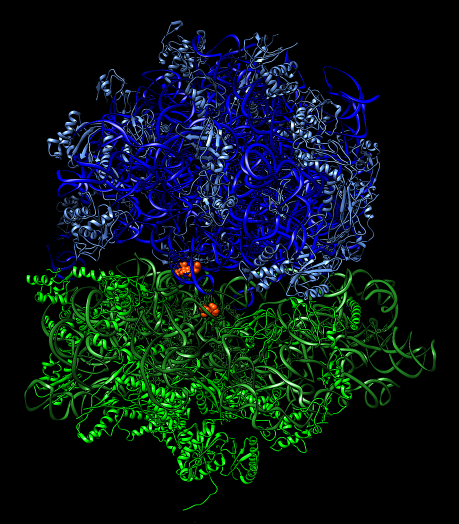 PDB entries 5cfs and 5cfu (colored blue in the Chimera session) show the enzyme before and after the reaction. Tobramycin is orange. In the “before” structure, a non-reactive analog of ATP (yellow) is used to freeze the reaction, and in the second structure, the nucleotide (colored lighter orange) has been attached to the antibiotic. 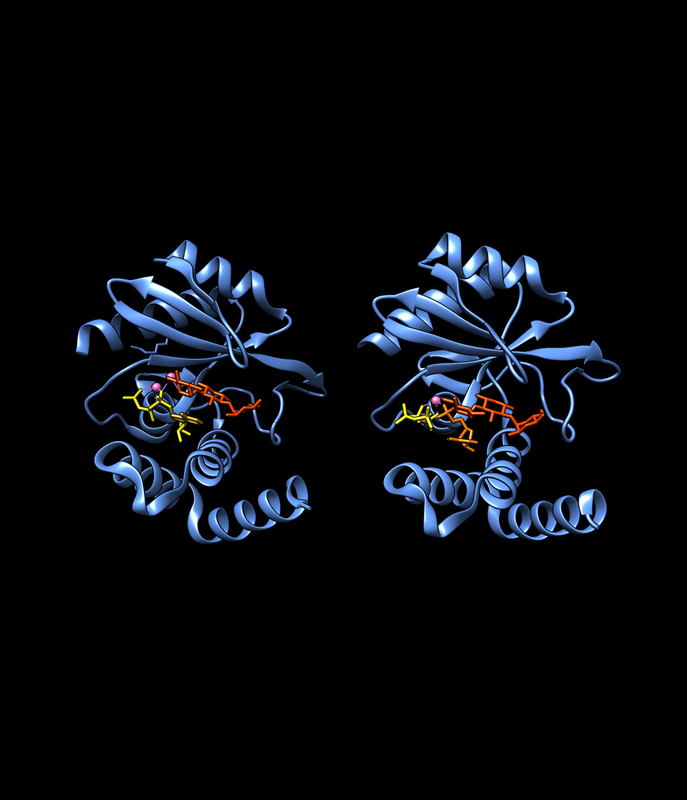 Crystal structure of a GCN5-related N-acetyltransferase: Serratia marcescens aminoglycoside 3-N-acetyltransferase. The structure contains 2 subunits (colored shades of blue in the Chimera session). 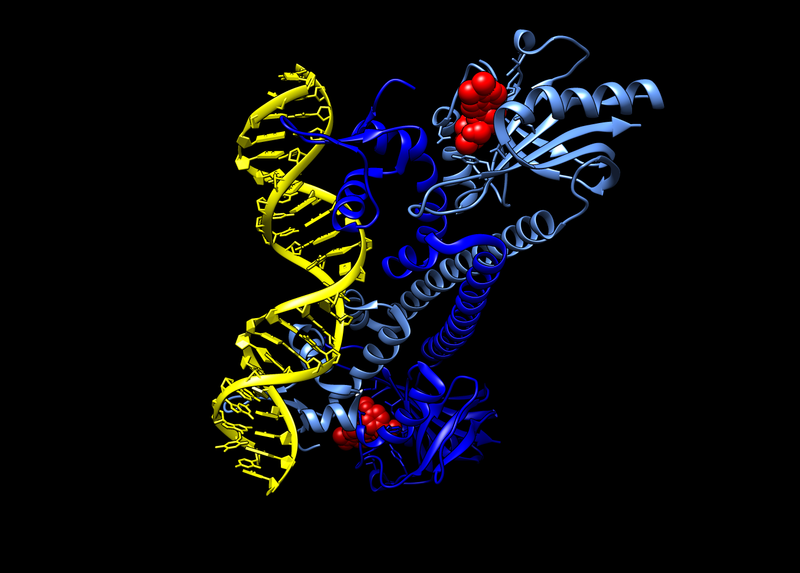 Each subunit has coenzyme A (COA - yellow) bound in the active site. Spermidine (SPD - orange) is bound in the gentamicin-binding site. 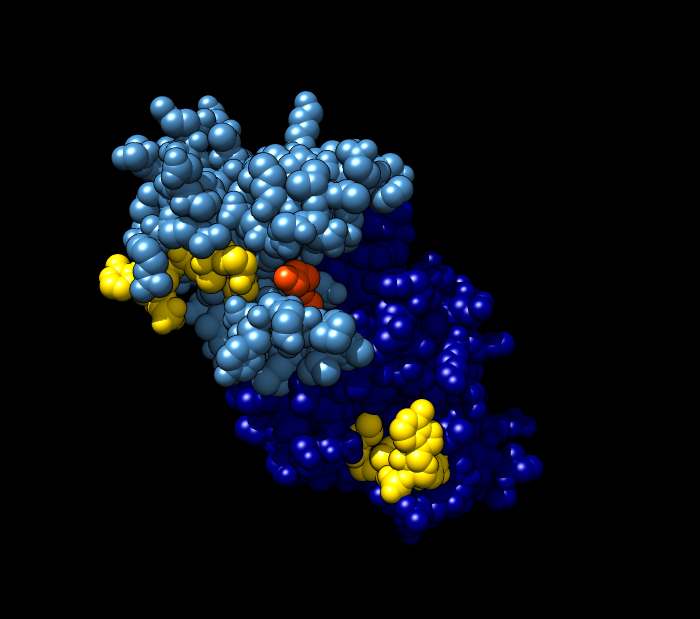 Aminoglycoside Phosphotransferase (colored blue in the Chimera session) is bound to Kanamycin (KAN – Orange) and ADP (yellow). The phosphate group colored darker yellow will be attached to Kanamycin during the reaction. The ribosomal methyltransferases modify ribosomes enzymatically by adding methyl groups to a nucleotide on the 16S rRNA in the aminoglycoside binding site. This does not affect the function of the ribosome, but prevents the antibiotic from binding. 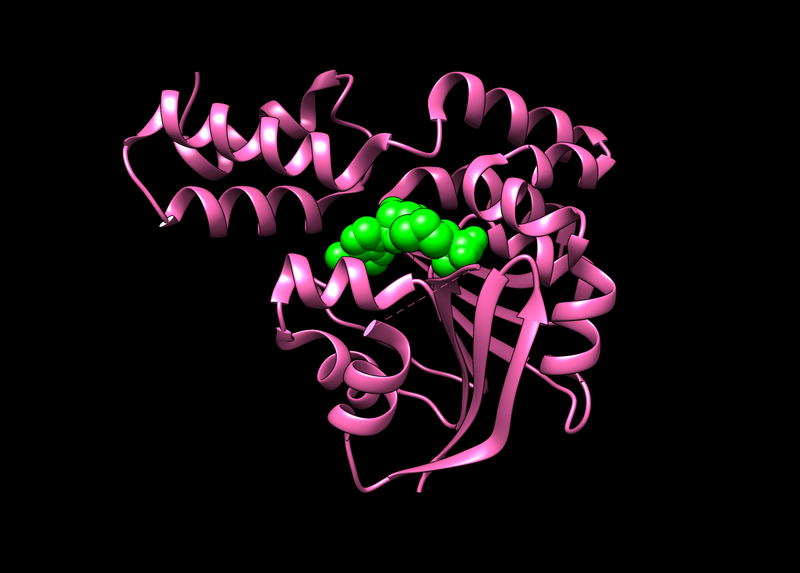 The structure shows small ribosomal subunit (colored green in the Chimera session) with the methyltransferase enzyme (Chain Y - magenta) bound to it. The key nucleotide (Adenine 1408) that the enzyme will add methyl group to in the course of the reaction is highlighted in lighter green. The structure shows the methyltransferase enzyme (colored magenta in the Chimera session) with S-adenosyl-L-homocysteine (SAH - green) bound in the active site. The S-adenosyl-L-homocysteine has a great structural similarity to S-Adenosyl methionine, the molecule that the enzyme normally uses to extract the methyl group from and add it to the nucleotide on the rRNA. Multidrug resistance transporters or efflux pumps find drugs that try to gain entry through a cell membrane and they transport them back outside. Bacteria possess multidrug resistance (MDR) gene regulators that can sense when the antibiotics get into the bacterial cell, and prompt the synthesis of the multidrug resistance pumps to eject them. 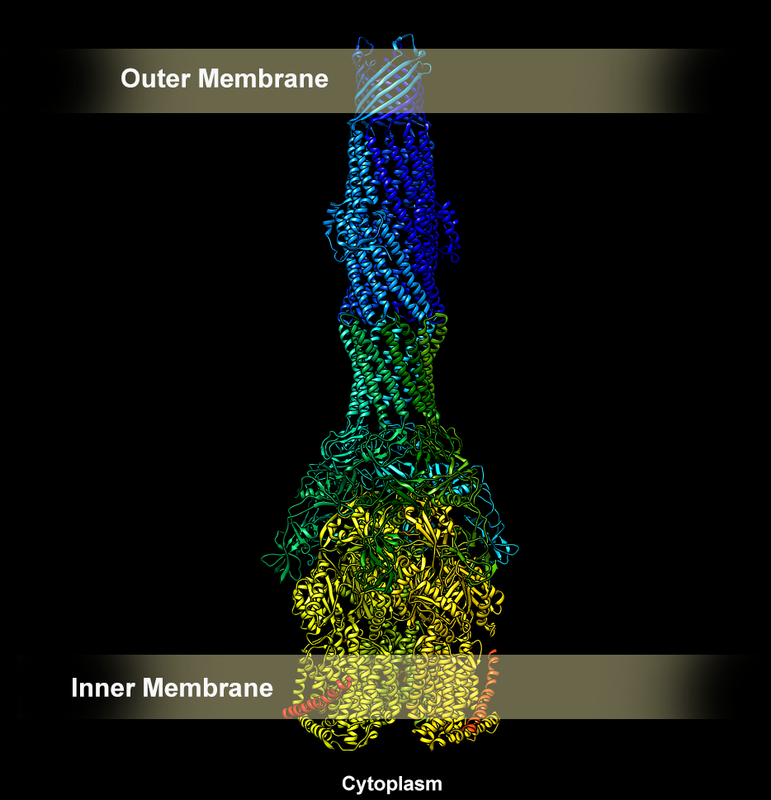 The structure shows an efflux pump from Gram-negative bacteria. For your reference, the inner and outer membranes are highlighted on the Chimera session preview. The structure shows a fragment of bacterial DNA (colored yellow on the Chimera session) with the gene regulator bound to it. 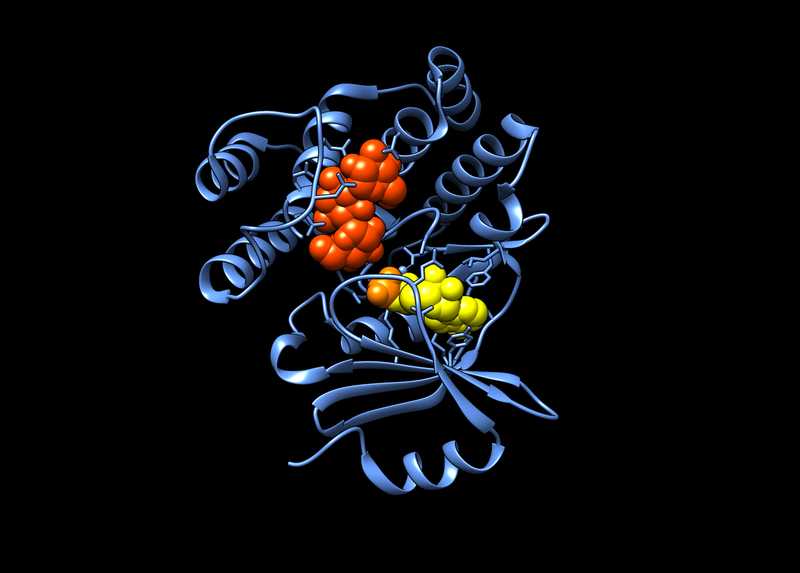 The gene regulator has puromycin (orange) bound in each subunit. The user guide for NGL can be found here. The NGL is the default 3D viewer accessible from each structure summary page, from the tab “3D View”. You can download and open these sessions using UCSF Chimera. Use the tutorials available here and here to edit the sessions, create animations or save pictures. Sylvie Garneau-Tsodikovaa and Kristin J. Labby (2016) Mechanisms of Resistance to Aminoglycoside Antibiotics: Overview and Perspectives. Medchemcomm. 7(1): 11–27.